Now there is a reliable option for a spinning sprinkler that hangs in an inverted position.Use the S5 Spinner for irrigation in organic and conventional production where all pipe and sprinklers are attached to the trellis wire and are thus up and out of the way of cultivation equipment. 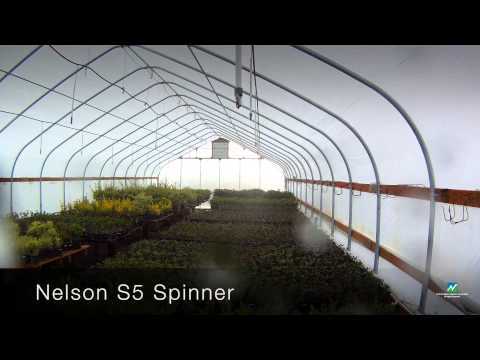 The S5 Spinner is meant to hang upside down. The barbed tubing inserts directly into HDPE pipe. Use a length of PVC pipe to keep the sprinkler hanging straight. Applications include: tree fruit, vineyards, greenhouse and kiwi. * Sealed bearing prevents stalling – even in conditions of blowing sand and dust. * Flow control nozzle options. * Can be applied to concentrate water application more heavily in the tree row with less being applied to the drive alley center.